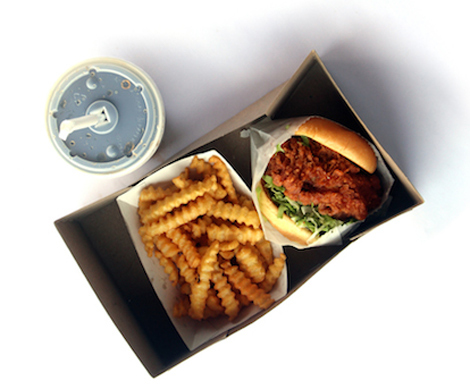 After months of anticipation, Shake Shack’s coveted chicken sandwich is finally available at stores across the United States. What was previously only up for grabs at the chain’s Brooklyn locations is now landing on Shake Shack menus almost everywhere starting today, January 13th, 2016 (NYC’s Theaters District Shack, JFK airport shacks, and stadium Shacks will have to wait a little bit longer). Shake Shack’s Chick’n Shack is what the fast-food restaurant calls a “modern twist on a classic,” featuring white meat chicken with a Southern-fried crust, shredded iceberg lettuce, pickles, and a buttermilk herb mayo all on a squishy Martin’s potato roll. So go ahead and treat yourself to something a little different for lunch this afternoon. If you’re in Manhattan, get smart and take a look at the live video feed of Shake Shack’s Madison Square Park location so you can avoid those treacherous lines.